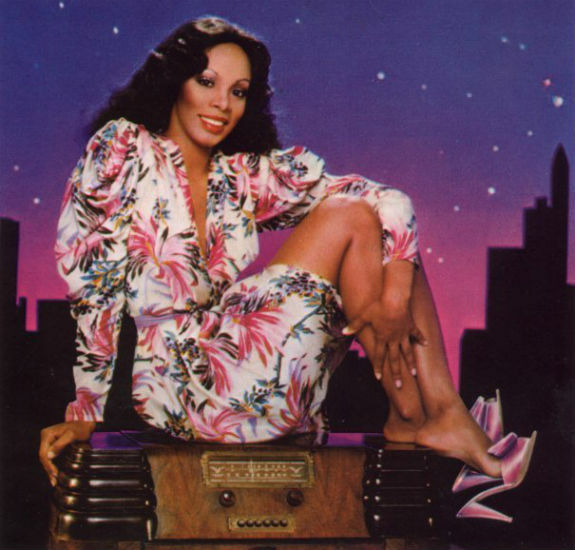 Donna Summer was born on New Year’s Eve 1948 in the Dorchester neighborhood of Boston, Massachusetts. She was one of seven children raised by devout Christian parents. Influenced by Mahalia Jackson, Summer began singing in the church at a young age. In her teens, she formed several musical groups including one with her sister and a cousin, imitating Motown girl groups such as The Supremes and Martha and the Vandellas in Boston. In the late 1960s, Summer was influenced by Janis Joplin after listening to her albums as a member of Big Brother and the Holding Company, and dropped out of school convinced that music was her way out of Boston, where she had always felt herself to be an outsider, even among her own family who ridiculed her for her voice and her looks. She joined the psychedelic rock group the Crow as lead singer, but the group was short-lived as they split upon their arrival in New York. In 1968, Summer auditioned for a role in the Broadway musical, Hair, but she lost the part of Sheila to Melba Moore. When the musical moved to Europe, Summer was offered the role. She took it and moved to Germany for several years. While in Germany, where she learned to speak German fluently, she participated in the musicals Ich Bin Ich (the German version of The Me Nobody Knows), Godspell and Show Boat. After settling in Munich, she began performing in several ensembles including the Viennese Folk Opera and also sang as a member of the pop group FamilyTree (created by the German music producer Guenter “Yogi” Lauke). She joined the group in 1973 and toured with them throughout Europe ….